Although we are still in the warm embrace of summer, the icy claws of winter are beckoning. Like the ants in Aesop’s fable, I spend an hour a day preparing for the upcoming season by cutting, splitting and stacking wood. – Cut the large trunks into about 18’ lengths. – Use the green hand cart to move the logs to the splitter. – Unload and split as required. 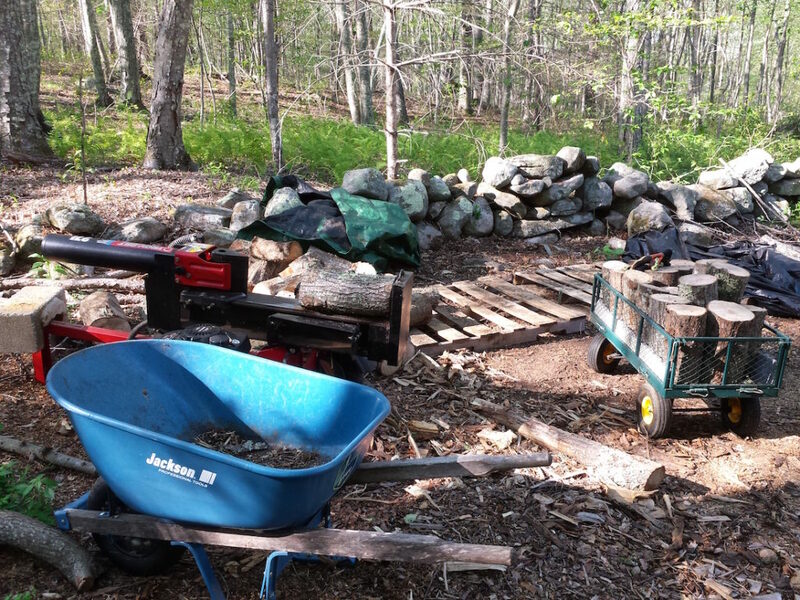 – Transfer the split logs to woodshed and stack with the wheelbarrow. – Carry logs into the house as required. – Feel the heat from the woodstove. That’s 6 distinct activities that expend my energy during the Process, and, especially now in the height of summer, do I get hot! It feels good. Although my body tires, my heart and arteries are no doubt thankful for the workout. Also, the physical exercise provides a good Balance to the more sedentary lifestyle that requires me to be in front of a computer every day. And, not only is it good exercise, it’s also cathartic for me. It puts me in Right Relationship with nature. Sometimes, when I split a log, I’ll discover a seething mass of ants rushing around. Are they in the Process of preparing for winter, too, like me? My young Japanese friend Rintaro is golf-obsessed. So I recently took him, and myself, for a golf lesson. There are about 7 golf courses within a 20-minute drive of my house – no lie! In the past, I played golf one or twice a year. Now I’m hitting the green at least twice a month. Our instructor Isaac first watched me swing the club. He immediately identified a key problem with my technique. I followed his directive and soon, I was hitting the ball much better. Isaac understands the Process of the golf swing and he helped me figured out how to be in Right Relationship with the club and the ball. He sees the Cause and Effect as I prepared to hit the ball. The following day, I played a round of golf with Rintaro and his father. It was the best game of my life! If only it were that simple in life! I need to practice more, but I have confidence that I will improve, even at my age. When we Journey not the golf course, but the path of our life, the Wisdom Wheel can give us pointers like Isaac did, so we can succeed and feel that we have accomplished much. The Wisdom Wheel laws can each play their part as we journey towards old age, giving us life lessons along the way. A golf course has 18 holes. Life has 81 years (or more) if we are lucky. The Wheel can be with us each day, of each year, helping us score well, in our jobs, with our families and friends, and with ourselves. I’ve just returned from a quick project in Singapore. 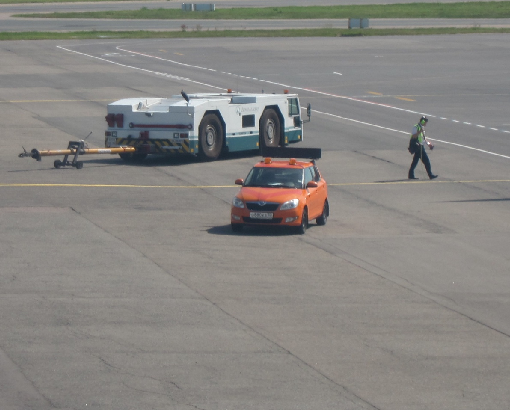 While in transit at the Moscow Airport, I saw a “Follow Me” car. 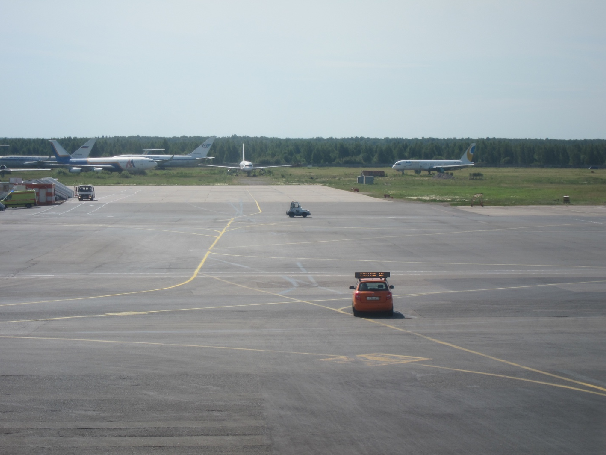 These cars assist and guide international landing planes to their proper taxi and gate. Naturally the “Follow Me” car driver knows his way around the airport runways and taxiways better than the pilots who fly into the airport only once in a while. It’s a pragmatic and effective Process to guide these metal flying behemoths when the pilot is in unfamiliar territory. I like to think we could use Wisdom Wheel as a “Follow Me” guide on our Journeys. When I find myself in unfamiliar terrain, or meet strangers, go new places, or experience new challenges, I use the Wisdom Wheel principles to get back to basics. It’s my calibration tool, guide, my compass. Even when I make mistakes, which I do often, I can forgive myself, because I’ve learned to be in Right Relationship with myself. “Follow Me” is the Ultimate Reality of the soul’s voice, the inner voice I listen to. May it continue to serve me well on the Journey. Can wisdom be bought? I could charge $1,000 for a Wisdom Wheel book or experience, but the guarantee of change afterwards depends entirely upon you. On the one hand we say we want change. We see violence and we want something different — peace, civility, stability and security. But we’re constantly delaying the Process. There’s emails to send, dishes to wash, kids to pick up, etc, etc. Our modern, busy culture has conditioned us to follow political candidates or religious leaders who’ll do the heavy lifting for us while we’re trying to get through the work week. The most unpopular among us tell the truth: that it is up to you to do the work. This will never make us financially rich, but it is immensely satisfying to be in the company of souls as they grow and evolve. This week, we celebrated the vision quest fast of a Wisdom Wheel graduate. Her dedication is paying off in ways that money can’t buy. Deeply embedded pains, old traumas and the despair around changes she faces have left her. When I put her out on her fast, I had to Trust that her Surrender of comforts, water, food, technologies would ‘work’. That Process is part of the Great Mystery. She was ready. The groundwork had been laid over 3 years. Every day, she said her prayers, did her work, ran her household, and journaled about the monthly Law in our study group. Receiving our daily emails on her 1,000 Day Journey and hosting our monthly study circles helped the Process, too. Devotion. Dedication. Reverence. What are these things worth? Community. Ceremony. Ritual. We need to make space for these things in our lives in order to anchor the changes in our day-to-day. This is how to bless yourself with the wisdom beyond your ken.